The latest edition of the conference which took place in New Delhi brought together the who’s who of Indian and global defence aviation to deliberate upon the challenges and opportunities in the Indian military aviation market. Indian Air Force (IAF) in next one and a half decades is expected to procure aircraft and engines of over $150 billion, growing at a rate of 10-15 per cent annually. Even in the short term, IAF is going to spend $20 billion on military aircraft. With the stated object of promoting ‘Make in India’ in defence, this offers massive opportunity to Indian and global aviation industry to come together and synergize other’s capability to offer Indian solutions for Indian requirement. 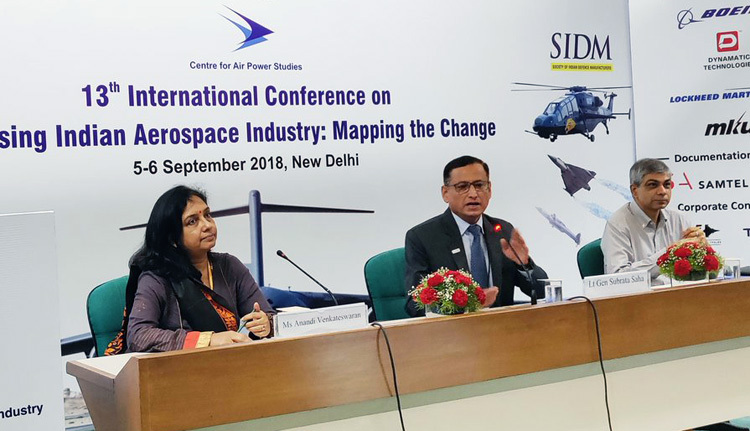 The two day seminar was organized by the Centre for Air Power Studies (CAPS), IAF supported think tank, along with Society of Indian Defence Manufacturers (SIDM)/ Confederation of Indian Industry and Indian Air Force (IAF). The event witnessed some of the biggest names of the industry sharing dais with the serving and retired Air Force officers and senior civil servants in an open environment. The inaugural session was to be attended by Dr G Satheesh Reddy, Secretary Department of Defence Research & Development and Chairman, DRDO and Air Marshal S B Deo, Vice Chief of Air Staff. But due to some reason Dr. Reddy missed the seminar. In his inaugural address, Air Marshal Deo discussed history of Indian failure in developing military aircraft starting from the HF-24 to LCA Tejas. "In order to succeed, we must learn to fail quickly,” he added. He wants India to take risk and in case of failure, Indian should learn move ahead. Speaking further he said, "The government cannot be more supportive than it is today. The impetus is on the industry to develop IP and innovate to Make in India." Appreciating Tejas, VCAS called it a beautiful, good aircraft which needs improvement which must be done quickly. Satish Kaura, Chairman Samtel Group, delivered the opening address at the conference. Giving Indian industry perspective Satish Kaura said, "For exports to fructify, IP must be generated and to that effect, government initiatives such as TDF and simplification of Make procedures have been great enablers." Highlighting the contribution of Indian industry in maintaining the operational readiness of the legacy aircraft of the IAF, Lt Gen Subrata Saha (Retd) Director General SIDM, said, "Exercise Gagan Shakti is a testimony of how the IAF is able to maintain a 50 year old legacy fleet with 95 (per cent) indigenous parts." In the next session Deputy Chief of Air Staff Air Marshal R Nambiar discussed the various indigenization projects of IAF including Modernisation of Airfield Infrastructure, AirForce Network (AFNET), Integrated Material Management Online System, Air Force Cellular etc. "The IAF is the only non-civilian entity which has its own cellular network, including hardened handsets,” he informed. He also discussed the existing procurement plan of IAF and said at present IAF is spending around Rs 50,000 crore on procurement. 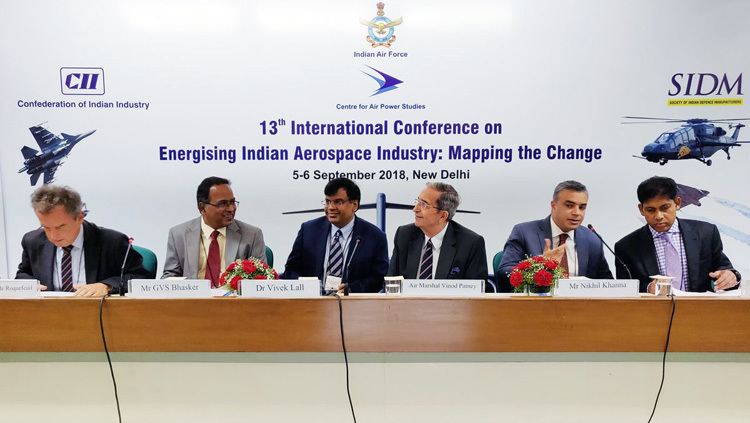 Later in the day, during a session on Make in India initiatives the panel comprised of Air Vice Marshal Vishwas Gaur, Technical Manager (Air), and representatives of industry discussed the status of modernization in Indian aerospace industry. During the discussion, Ashwani Bhargava, Director, Supply Chain Management, Boeing India, said: "In the context of Make in India, Boeing is ready to bring it on!" In next session, Air Marshal R K S Shera, Air Officer In-Charge Maintenance (AOM), discussed the IAF’s requirements and opportunities accorded by it in the field of Maintenance and Repair. 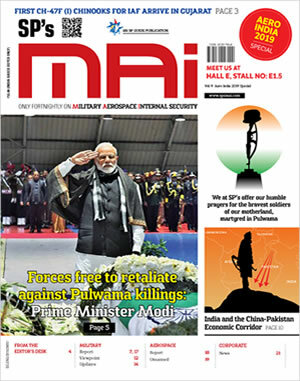 "IAF operates a mix of legacy and state-of-the-art equipment which presents unique challenges which are opportunities in disguise for the private industry which can benefit from a wide range of MRO projects,” Air Marshal Shera said. He discussed in detail the indigenization work being carried out at the base repair depots. As the states governments are attracting investments into aerospace sector and coming up with defence industrial corridor and aerospace special economic zones, the seminar brought together representatives of Tamil Nadu, Andhra Pradesh, Telangana and Uttar Pradesh. The session highlighted the various initiatives by the state governments in attracting investments in the sector. They also agreed to recognize the value veterans can add in hand holding startups and MSMEs seeking to enter the defence sector. In the session on expectation from the government, industry leaders raised their views on the various topics ranging from exports to supply chain. Sanjay Jaju, Joint Secretary (DIP), gave the special address where he appreciated the SIDM’s for “collating industry recommendations, most of which have been adopted by the Government of India in the revised policies." Talking about easing of export policy Rajesh Gupta of MKU said, "One of the expectations the Industry has from the government is to act as an enabler and facilitator of growth by setting up common testing facilities which may be accessed by companies of all scale." Another panelist Ankit Mehta, CEO & Co-founder, Idea Forge, asserted that "encouraging participation of the domestic private industry makes not just strategic but also economic sense.” Expressing similar view, Bharat Harkishan Malkani, CMD Max Aerospace & Aviation said, "There is tremendous opportunity for the Indian aviation Industry by way of aircraft maintenance, modification and upgradation projects." In his submission, Deepak Sharma, Head - Procurement & Supply Chain Management, BAE Systems India, said that "Foreign OEMs should bring in technology as well as intellectual property and involve the entire ecosystem which, in turn, creates a flat economy benefiting all stakeholders." The next day’s session began with special address by Dr Pankaj Sharma, Joint Secretary (D&ISA), Ministry of External Affairs, where he expressed confidence that “the government and the Indian Industry will be able to collaborate to take advantage of export opportunities while conforming to the needs of the proliferation restrictions in vogue." His junior in the ministry, Anandi Venkateswaran, Under Secretary (D&ISA), in her submission on Implication of India’s Membership to Export Control Regime (Wassenaar) said, "Among other benefits, India's membership to the Wassenaar Arrangement will allow the Indian Industry to freely trade in dual-use technologies with global players." "In applying the Wassenaar Arrangement norms, MEAs role is not that of a controller but rather that of a facilitator conducting screening which further strengthens the export business,” she added. The next session was focused on the real movers of any industry, the Medium, Small, Micro Enterprises (MSME). During this session the impact of policy changes on the performance of the MSMEs was discussed. Speaking on the MSMEs role in this sector, Abhishek Jain, VP Strategic Partnerships, Zeus Numerix, said, "I have one thing to say to the MoD, test us and then trust us. We have a fantastic capacity." Adding to it, Sai Pattabiram, MD, Sree Sai Aerotech Innovations said, "SMEs are nimble companies and can develop products much faster than any other stakeholder in defence manufacturing due to low overhead costs." The session moderator, Air Vice Marshal PK Srivastava VSM (Retd), Former Director, Bharat Dynamics, in his remarks said, "Can crowd funding be explored as an option to support projects like the Technology Development Fund which enables innovation in technology development?" In the final session of the conference, the captains of some of the leading aerospace companies discussed the challenges and opportunities in setting up of research and manufacturing facility primarily due to high cost. Dr Vivek Lall, VP, Strategy and Business Development, Lockheed Martin Aeronautics-talked about his company’s outlook on establishing research partnership with Indian firms, and said, "The policy of Lockheed Martin for India is to develop technology with the Indian Industry with a worldwide footprint." Similarly, Nikhil Khanna, Managing Director - India, BAE Systems, asked SMES to look at the OEMs as R&D partners, not just as manufacturing partners. 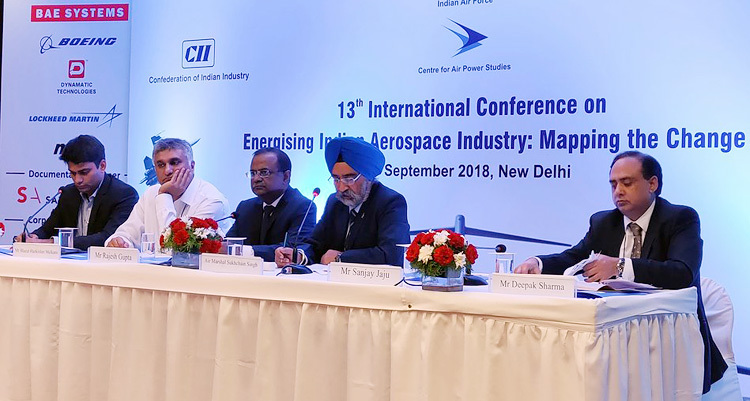 Putting across public sector perspective, GVS Bhasker, Chief Executive Officer (Helicopter Complex), Hindustan Aeronautics, said that “there are ample opportunities in manufacturing, MRO as well as indigenization, although they may not be easily accessible. But, to borrow from HAL's legacy, persistence pays." According to Emmanuel de Roquefeuil, Vice President & Country Director, Thales India, "Joint ventures between FOEMs and the indigenous Indian defence and aerospace industry are an excellent way for both parties to increase their global footprint." Winding up the two day conference, Lt Gen Saha, said, "I would like to reassure the industry that every suggestion, every feedback received is being compiled and is communicated to the highest offices within the South Block."